The shoulder is a very mobile joint and because of this its stability is compromised and makes it prone to injury. There are many reasons you can get pain in the shoulder, from a bursa or tendon becoming inflamed to a rotator cuff injury, arthritis or referral from elsewhere so it is always important to seek advice. At attend2health we are able to diagnose where your pain is coming from and create a tailored treatment plan to relieve your suffering. There are also exercises you can do to help. If you sign up to the silver package you will see some examples on this site however they should be completed pain free and it is advisable to check with a health professional first. Attend2health offers a free 15 minute chat for you to see if our health professionals are the right ones to help you on your road to recovery. Call us now on 01763 878087 for more information or visit our facebook site https://www.facebook.com/attend2health/ to see some of our honest reviews. If you do decide to book to see one of our Chiropractors, Osteopaths or Physiotherapists we would go through a case history to try and find out whats causing your pain. We would ask questions like how long you have had the pain, any aggravating factors, does the pain travel anywhere or just stay in the same place, does it stop you sleeping? These will all help us in determining what's wrong. We would then do an examination where we would check the movement in your joints. We would feel for any joints that might be locked and check the muscles for any tightness. We would also check your reflexes and sometimes your blood pressure to help us come to a diagnosis. Subacromial Impingement or shoulder impingement The rotator cuff muscles become weak and alter the movement pattern within the ball and socket joint so when the arm is lifted the space for the tendons decreases trapping the tendons. The tendons then become inflamed as they pass through the subacromial space. This can result in pain, weakness and loss of movement in the shoulder. Bursa are fluid filled sacks which generally lie under tendons to prevent friction. Sub acromial bursitis is caused when the bursa which is under the supraspinatus tendon becomes inflamed. This can happen from overuse injuries in Rheumatoid arthritis or can also come from impingement. This is also known as frozen shoulder and no one knows what causes it. it is more common if you also suffer from Diabetes Mellitus, Heart disease or a connective tissue disorder. The capsule of the shoulder becomes inflamed and stiff restricting the movement in the shoulder greatly. This can be extremely painful especially at night and can be very hard to move the shoulder. Osteoarthritis or OA in the shoulder is when the cartilage in the shoulder starts to wear away. You may get bony growth occurring as well as swelling and pain. This is an auto immune disorder and can be diagnosed through a blood test. RA can cause swelling and redness symmetrically on both sides of the body. The shoulder can feel stiff and have less movement. A disc in the neck which has slipped or prolapsed and is pressing against a nerve in the neck can cause pain to radiate down into the shoulder. Pain may be felt in the top of the shoulder and you may get some tingling or shooting pain when you abduct the arm. The neck may also feel very stiff and sore. This is when there is compression of the nerves, arteries or veins from the lower neck to the armpit. If the nerve is involved you may experience pain down into the hand with tingling or weakness. If the vein is involved the arm may appear bluish in colour with swelling whereas if the artery is trapped the arm will appear cold and pale. Causes include repetitive movements, trauma or an extra cervical rib. For information on the types of diagnosis in the shoulder please see Silver membership. 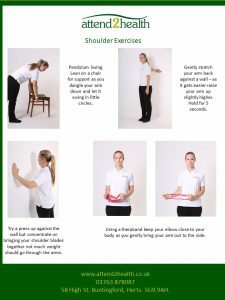 Lots of different exercises can be found on the Silver Membership page. Here is just one example. 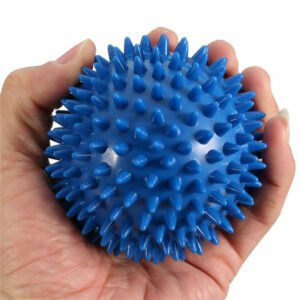 This spikey ball can be good to roll near the shoulder blade to help release tension.